The layout is owned by Ray Lewis and was featured in the April 2017 issue of Model Rail magazine. It has attended several exhibitions in recent years. 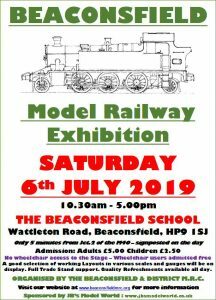 If you are interested in inviting the layout to an exhibition please contact Ray (who is the club secretary) via the link on this website. St.Luke’s is the northern district of a large town, which itself is located on a former G.W.R. main-line heading Westwards from London. St.Luke’s is the first station on a secondary line running North out of the main town station. The line was built as in independent railway, but taken over in time by the G.W.R. – but not before the Midland Railway had acquired running rights. The Midland services branch off to several stations further Northwards onto their own (former LMS) route to Birmingham, with the G.W.R. line continuing independently onwards into the Midlands. Back at the main station in the town, the Southern Railway made a connection from the South, using it’s own bay platform to terminate passenger trains, but through goods trains and the odd through passenger train made use of the line through St.Luke’s. Following Nationalisation in 1948, the line is now in the hands of the Western Region – but Midland Region trains still run through to the main town, as do the through trains to and from the Southern Region. During WW2 the route played a major part in the North-South movement of essential goods and the build up to D-Day, but services now are back to the level seen prior to the war. The pill-box is a reminder of the lines wartime importance. Some people may see a similarity to the situation at Reading, but it could just as easily be a place in Wiltshire or North Somerset, or perhaps even Gloucestershire. The name and true geographic location of the main town remains, however, a bit hazy. 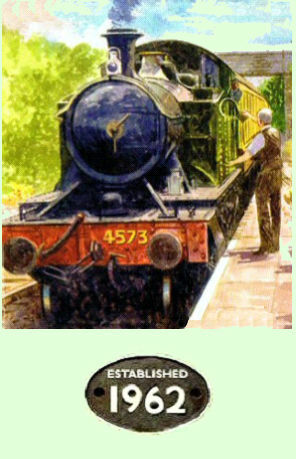 One of the key features of St.Luke’s is the engine shed, which supplies the motive power requirements of the town’s train services. This is mainly linked to shunting and local goods / passenger services, but the odd “big” locomotive can be found on shed sometimes, awaiting it’s return trip train. There is also the canal basin, which was a major transport interchange hub years ago – but is now fast fading into oblivion. None the less, a barge has docked today. Local goods traffic hangs on for now, but increased road transport competition, here as all over the country, is slowly killing it off. Within a very few years only passenger trains, exclusively in the hands of DMUs, will have any business for St.Luke’s. The line was very fortunate to escape the Beeching axe! 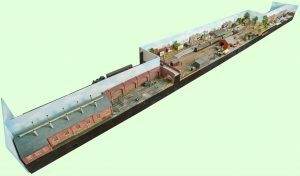 The engine shed will be demolished in the late 1960’s and the goods yard will fall into decay, although a local road transport company will make use of the goods shed. By the mid -1970’s the station buildings will have been replaced by a “bus shelter” and the station downgraded to “halt” status. The canal warehouses will become desirable waterside apartments for the young but upwardly mobile set – who take advantage of the Inter-City services from the main town station to commute into the major Cities to work.